Following a planned maintenance period in Victoria, BC, Asterix, Canada’s only naval support ship on February 6 departed for a year-long tour. Federal Fleet Services owns and operates the Asterix, which was built by its sister company Davie Shipbuilding. It will take part in a series of international exercises and security operations throughout the Pacific Ocean, Asia, Middle East and East Africa. Asterix is the largest naval ship ever delivered from a Canadian shipyard. 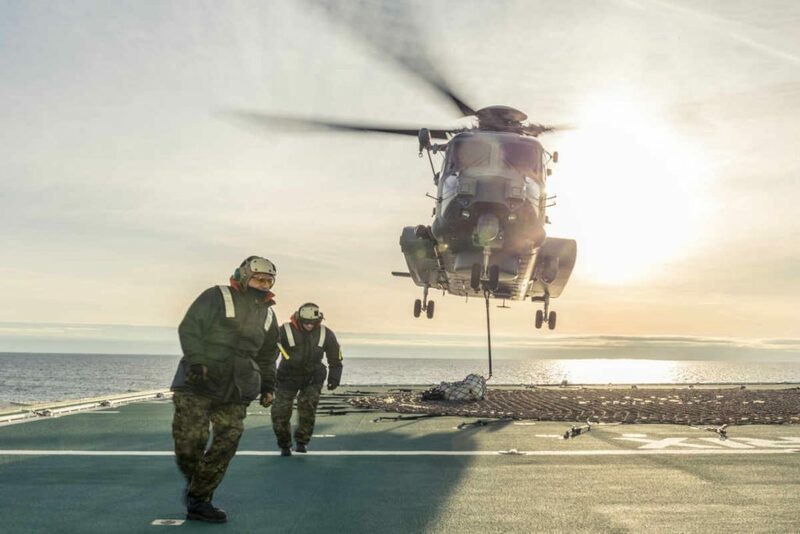 In January 2018, Asterix completed its at-sea trials and testing for the Department of National Defence and entered full operational service. The February 6 deployment marks the first embarked CH-148 Cyclone detachment from 443 Maritime Helicopter Squadron. The Sikorsky CH-148 Cyclone is a twin-engine, multi-role shipboard helicopter developed by the Sikorsky Aircraft for the Canadian Armed Forces. Asterix is accompanied by HMCS Regina, a Canadian Patrol Frigate also built at Davie Shipbuilding, and is now enroute to the Indian Ocean where the two ships will take part in Operation Projection, Canada’s ongoing commitment to the region with its international security partners. “We’ll be fortunate enough to be working with NRU Asterix so we can maintain a forward presence in the region, get through the long legs required in the Indo Asia Pacific for stores and fuel, increased medical facilities, and an expanded inventory of spare parts,” HMCS Regina’s Commanding Officer, Commander Jake French, told Lookout Newspaper. Vicefield continued to explain that with Canada’s only naval support ship now deploying for another year-long tour, there are no support ships to service the rest of the fleet, specifically those operating within and defending Canada’s three coastlines. “This would be an uncomfortable position for any navy to be in so we hope the government delivers on the recommendations from the House of Commons and the Senate to proceed, without delay, to build a second ship, the Obelix,” he said.